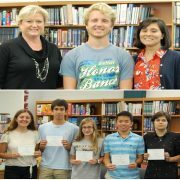 Congratulations to Nathaniel Baker, who was named a National Merit Scholarship Program Semifinalist, and Samantha Zhang, Susanna Maize, Benjamin Keener, Thorin Jean, Jeffrey Shi, Ekaterina Savelyeva, and Lehman Montgomery, who were named National Merit Commended Students. Nathaniel Baker is one of approximately 16,000 academically qualified semifinalists throughout the nation who will have an opportunity to continue in the competition for some 7,500 National Merit Scholarships worth more than $32 million that will be offered next spring. 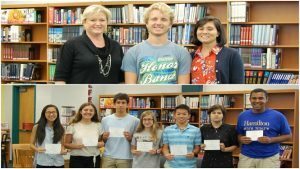 Semifinalists placed among the top one percent of more than 1.6 million students across 22,000 high schools who entered the 2018 competition by taking the 2016 Preliminary SAT/National Merit Scholarship Qualifying Test. The students being named Commended Students have demonstrated outstanding potential for academic success. 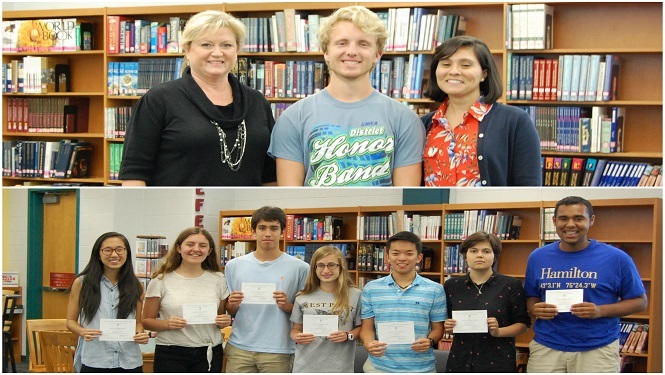 Although they will not continue in the 2018 competition for National Merit Scholarship awards, Commended Students placed among the top 50,000 scorers of more than 1.6 million students who entered the 2018 competition by taking the 2016 Preliminary SAT/National Merit Scholarship Qualifying Test. To learn more about the National Merit Scholarship program, click here. FBLA meeting on Monday, October 2 during AEP. All members should attend and be sure to bring your $12 dues if you have mot already paid. SENIORS-If you have not had your senior picture made, see Ms. Green in room 152 ASAP! Also, make your pose selection for the yearbook by November 1st. You MUST have a parking permit to park on school grounds. If you are parking without a permit, your name is now on the Debt List. Security will be checking for permits again this week. Please be aware, you will not be able to purchase a Homecoming ticket if your name is on the Debt List. National English Honor Society applications are due today, September 29 by 2:30 to Mrs. Christie or Ms. Mustard in Office 214! Are you interested in a career in Law Enforcement or have ever wondered what it would be like to be a Police Officer? If so, now is your chance to experience the day to day duties of a Police Officer by joining the James City County Police Explorer Program. Please see Officer Ferriero if you are interested in joining. Want to start your day right! Sign up for the Jamestown High School walking club this week. The walking club will meet at the track about 7AM- 7:12AM on Monday’s and Thursday! For a ten minute brisk walk. If you sign up and complete 10 of the 14 sessions you get a free T-shirt, Free Chick-Fil-A meal card, Free fruit and free fruit after the walk. The first day is next Monday, October 2nd. Pick up a flyer from any Cross Country runner at lunch, from Coach Tompkins or outside room 134! Homecoming…On the Range. Dance October 7th 8:00-11:00 pm in the courtyard. Tickets are $15.00 each. Sold ONLY during lunches week of October 2nd-6th (No EXCEPTIONS-No tickets sold at the door) If you plan to bring a date from a different school, date approval forms are available in the main office and are due back no later than October 5th. Attention all freshmen!! We are RE-VOTING for class officers. Please go to our school website for the link to vote again. Voting closes on today, September 28 at 2:00pm. National English Honor Society applications are due Friday, September 29 by 2:30 to Mrs. Christie or Ms. Mustard in Office 214! Attention seniors! If you have an overall GPA of 3.5 or better and are interested in membership in the National Honor Society, please see Mr. Meredith in room 238 for details. Again, seniors with an interest in the National Honor Society, see Mr. Meredith for details. Attention JHS Medical Explorers: Please join us in welcoming speaker Allison Bloom at our meeting after school TODAY in room 135. All students interested in pursing a career in the medical field are invited to attend. There will be a scholastic bowl meeting after school in room 234 on today, September 27th. Please see Mr. Gross or Mr. Eames if you have questions. There will be a scholastic bowl meeting after school in room 234 on Wednesday, September 27th. Please see Mr. Gross or Mr. Eames if you have questions. Attention Freshman Class! Voting has started for officer positions. Please check your remind, the school website, and twitter for the link to vote. Voting ends on Wednesday at 2:30! Want to start your day right! Sign up for the Jamestown High School walking club this week. The walking club will meet at the track about 7AM- 7:12AM on Monday’s and Thursday! For a ten minute brisk walk. If you sign up and complete 10 of the 14 sessions you get a free T-shirt, Free Chick-Fil-A meal card, Free fruit and free fruit after the walk. The first day is next Monday, October 2nd. Pick up a flyer from any Cross Country runner at lunch, from Coach Tompkins or outside room 134! Attention all French Honor Society members and new inductees–please come to our first meeting of the year on today, September 25th, during AEP in room 220. Please bring yours dues, and graduating seniors, make sure to buy your cords. See you then! Attention Gang Green members: please attend our tailgate before our home football game at 11:30 am TOMORROW in the parking lot of Wanner Stadium. Wear your Gang Green shirts! Congrats to the Girls and Boys Cross Country team for 1st place against York and Smithfield. The team is 5-0 in the Bay River District! Anyone interested in audition for the theatre production of A Christmas Carol, should sign up for an audition time outside of room 182 on the arts hallway. Auditions will take place Monday after school, all are welcome. Please contact Mr. Stone with questions. Student tickets for the football game vs. Grafton will be on sale today 9/22 from 7:00 am – 2:00 pm in the main office. Tickets are $3.00 and you may only purchase one ticket. Only Jamestown High Schools students will be admitted with a student ticket-all others will be denied entry into the game. If you purchase tickets at the stadium, they will be $6.00 each. Attention all French Honor Society members and new inductees–please come to our first meeting of the year on Monday, September 25th, during AEP in room 220. Please bring yours dues, and graduating seniors, make sure to buy your cords. See you then! ASVAB signup sheet is posted in the counseling office. Signed up to donate blood Friday, September 22nd in the auditorium? Remember to bring a picture ID and eat a good breakfast. Thanks for being willing to give the gift of life! Anyone interested in audition for the theatre production of A Christmas Carol, should sign up for an audition time outside of room 182 on the arts hallway. Auditions will take place Monday afterschool, all are welcome. Please contact Mr. Stone with questions. Student tickets for the football game vs. Grafton will be on sale Friday 9/22 from 7:00 am – 2:00 pm in the main office. Tickets are $3.00 and you may only purchase one ticket. Only Jamestown High Schools students will be admitted with a student ticket-all others will be denied entry into the game. If you purchase tickets at the stadium, they will be $6.00 each. JHS Athletic Trainer, Amanda Miller, has been nominated for the Newell National Athletic Trainer of the Year award for her service and leadership. to help Ms Amanda advance on, visit the Newell Award.com/tidewater orto. Science Olympiad will meet today (Sept. 19th) at 2:30 in room 144. Anyone interested in joining Gang Green and current members-our Fall meeting will be held on today, September 19 in room 213. Boys Tennis organization today, September 19 in room 213.